Over the course of the history of the Church various aspects of this story have gained importance for the believers. In the first centuries of Christianity it was especially Simeon who stimulated the imagination. His song of praise formed the root of the festum Simeonis. When later on those who venerated Mary looked for links with their devotion, the attention shifted from Simeon to the mother of Jesus. The author of the most read gospel story book of the late Middle Ages, the Meditationes Vitae Christi, has Mary kneeling before the altar. She offers her son to God. The writer makes us adore her, who is so humble that she goes to temple to bring a purification sacrifice despite the virgin birth. Joseph follows her somewhat clumsily with the two doves. Now the presentation in the temple has become the feast of the Purificatio Beatae Mariae Virginis. With the Reformation all light fell on Jesus. Today preachers pay a lot of attention to the fact that with his circumcision Jesus embraced the Jewish religious traditions and placed himself under the law. As a child I was totally fascinated by the presentation in the temple, as we had a reproduction in our home of the painting shown above. I had never suspected that the temple was such a majestic building, filled with the mysteries of God. But I was even more captivated by the old Simeon, who sings and looks up with the source of our salvation in his arms. A real tearjerker. Even now, whenever I hear the Nunc dimittis, I am moved by this aged man, who starts to sing when at the end of his life he recognizes his savior in this child. Over the course of time Simeon has made me reflect on three things in particular. In the first place his story makes clear that salvation is a somebody. It is a child that you can take into your arms. Perhaps Rembrandt’s pupil Aert de Gelder has portrayed this even more penetratingly than the master himself (see below). Salvation is a Savior. You can hold him in your arms, while you look up in utter thankfulness. Time and again people have tried to depersonalize salvation, for instance into a system, an abstract doctrine or the sum of our values. Sometimes you hear a kind of minimum credo: “There is bound to be something.” But in the Christian faith it is not something but someone you believe in. That is what Simeon has experienced, the Word become flesh. Secondly this story makes clear that you have a part to play as well. Probably there were more boys that were brought to the temple to be circumcised that day. Yet Simeon saw salvation in this one child. Nothing is being proven to him. No one is trying to convince him. He observes and gives meaning to his observation. Seeing is believing. If there is one gospel story that can give hope to art historians, it is this one. But thankfully not only to them. Simeon makes clear that salvation comes to you, when you discover it. But you do need to be in the right spot. Simeon came into the temple guided by the Spirit, looking for solace. This ‘looking for’, this being on a quest, is my third point. 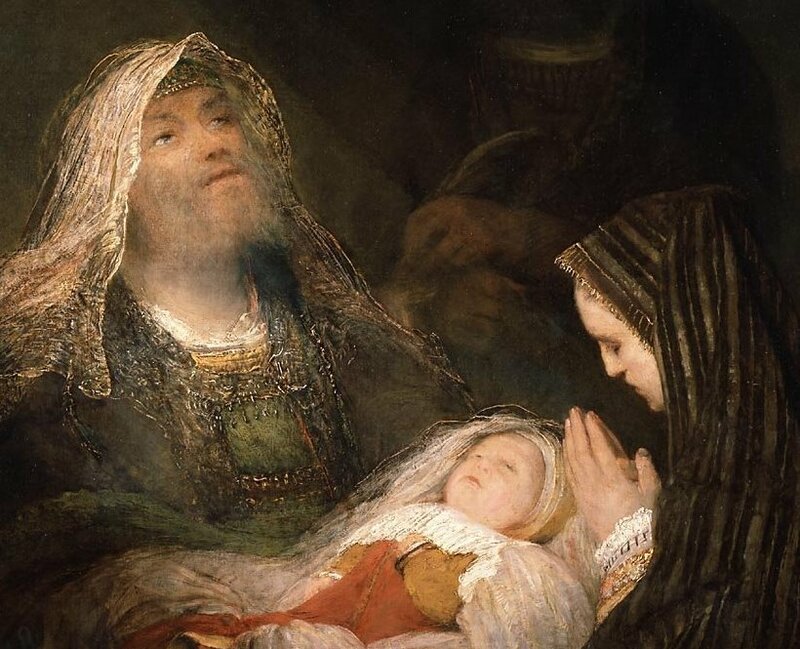 All of his life Simeon had learned to live in expectation. He lives in the knowledge that something is awaiting him, it is an open existence. Otherwise there would be nothing to see or discover. Which means that one needs to be raised and educated in this. One needs to know the stories that embody hope and expectation, and one needs to have seen the images that have been inspired by them. Otherwise there is nothing that can be seen and believed. A few of the many hours that are now spent on developing opinions about all kinds of things, should be spent on the telling of stories that can bring hope and consolation. Preferably accompanied by images. This meditation is a guest sermon given by Prof. dr. Henk van Os on January 18, 2004 in the Obrechtkerk in Amsterdam. Rembrandt Harmensz. van Rijn: Simeon’s Song of Praise, 1631, oil on panel, 61 x 48 cm, Mauritshuis, The Hague, The Netherlands. 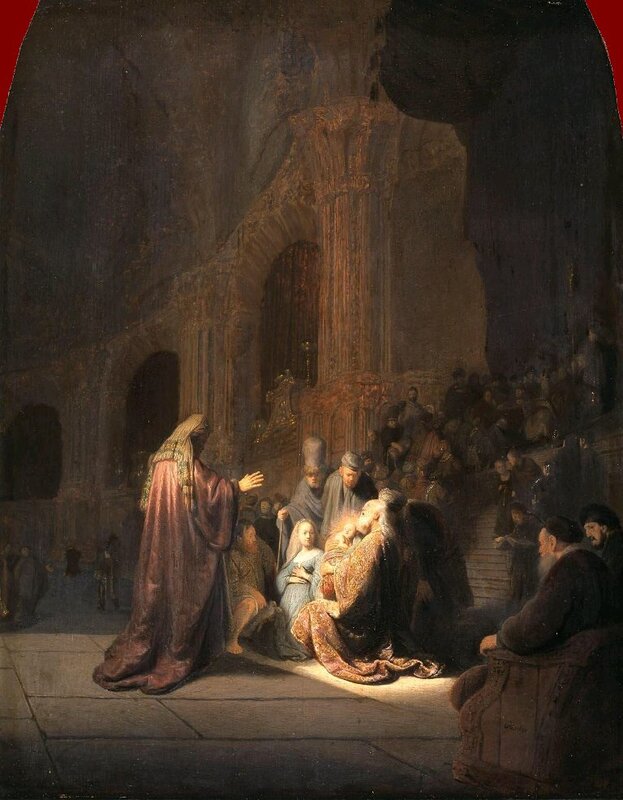 Arent (Aert) de Gelder: Simeon’s Canticle, 1700, oil on canvas, 94,5 x 107,5 cm. Mauritshuis, The Hague, The Netherlands. Henk van Os (1938) studied art history in Groningen, The Netherlands, where he later took up the post of professor. His PhD dissertation dealt with images of Mary in late medieval paintings in Siena. His specialization is early Italian painting. In 2016 he retired as Professor of Art and Society at the University of Amsterdam. From 1989-1996 he was director of the Rijksmuseum in Amsterdam. In the Netherlands he is especially known for the popular television art programs Beeldenstorm and Kunstschatten, in which he made art accessible for a large audience.